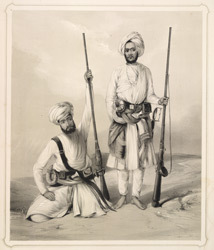 This lithograph was based on plate 16 from Emily Eden's 'Portraits of the Princes and People of India'. Eden wrote of the Arab companions of Sir Alexander Burnes: "It is believed that these men were connected with the Arab Tribes in and near Cabool, descendants of the original Arab conquerors, at the time of the introduction of Mohamedanism into Affghanistan. These tribes still remain separate from the general Affghan population of the country". Burnes (1805-41), a talented and colourful figure, had been the British Political Agent at Kabul, and was killed during the first Afghan war. He was famed for his journeys through Afghanistan and across the Hindu Kush into Persia and Bukhara, writing an immensely popular account of his travels, published in 1834. He spoke Hindi and Persian and was known to wear Afghan attire.